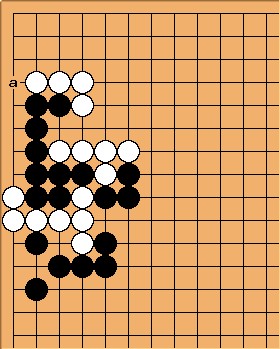 Qi: White wins the race. ChrisSchack: Doesn't status imply either player might move first, and part of the question is if either side needs a move? Looks to be unsettled, whoever plays first wins. Dieter: That's right. If White goes first, it becomes a fight between two "blind" groups. 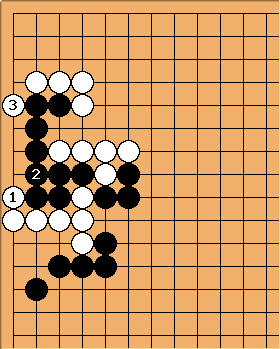 White has one liberty more - an outside liberty in fact - making him the favourite and capture Black. 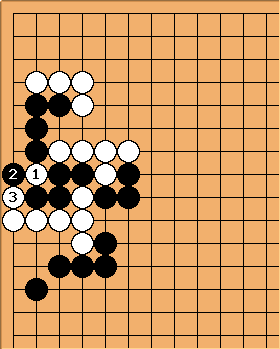 If Black goes first, he decides the liberty race in his favour. Bill: It is worth pointing out that a is a liberty for Black, in the sense that if White had a stone there she could escape or capture. Dieter: Right. Which goes to show that liberties is a "case-sensitive" concept. Can we rephrase the above as "... escape AND kill" ?